“I have come that they may have life, and that they may have it more abundantly. ‘I am the Good Shepherd’” (John 10:10-11). Your Savior Is In Heaven ~ “For our citizenship is in heaven, from which we also eagerly wait for the Savior, the Lord Jesus Christ, who will transform our lowly body that it may be conformed to His glorious body, according to the working by which He is able even to subdue all things to Himself” (Philippians 3:20-21). Your Inheritance Is In Heaven ~ “Blessed be the God and Father of our Lord Jesus Christ, who according to His abundant mercy has begotten us again to a living hope through the resurrection of Jesus Christ from the dead, to an inheritance incorruptible and undefiled and that does not fade away, reserved in heaven for you, who are kept by the power of God through faith for salvation ready to be revealed in the last time” (1 Peter 1:3-5). Your Name Written In Heaven ~ Jesus said, “Rejoice because your names are written in heaven” (Luke 10:20b). Your Citizenship Is In Heaven ~ “For our citizenship is in heaven, from which we also eagerly wait for the Savior, the Lord Jesus Christ, who will transform our lowly body that it may be conformed to His glorious body, according to the working by which He is able even to subdue all things to Himself” (Philippians 3:20-21). Your Hope Is In Heaven ~ “We give thanks to the God and Father of our Lord Jesus Christ, praying always for you, since we heard of your faith in Christ Jesus and of your love for all the saints; because of the hope which is laid up for you in heaven, of which you heard before in the word of the truth of the gospel, which has come to you, as it has also in all the world, and is bringing forth fruit, as it is also among you since the day you heard and knew the grace of God in truth” (Colossians 1:3-6). Your Master Is In Heaven ~ “And you, masters, do the same things to them, giving up threatening, knowing that your own Master also is in heaven, and there is no partiality with Him” (Ephesians 6:9). Your Home Is Heaven ~ “But now they desire a better, that is, a heavenly country. Therefore God is not ashamed to be called their God, for He has prepared a city for them” (Hebrews 11:16). Fellowship in The Church ~ “Now I plead with you, brethren, by the name of our Lord Jesus Christ, that you all speak the same thing, and that there be no divisions among you, but that you be perfectly joined together in the same mind and in the same judgment” (1 Corinthians 1:10). “And they continued steadfastly in the apostles’ doctrine and fellowship, in the breaking of bread, and in prayers” (Acts 2:42). Fellowship in Service ~ “For we are God's fellow workers; you are God's field, you are God's building” (1 Corinthians 3:9). “Tychicus, a beloved brother, faithful minister, and fellow servant in the Lord, will tell you all the news about me. I am sending him to you for this very purpose, that he may know your circumstances and comfort your hearts, with Onesimus, a faithful and beloved brother, who is one of you. They will make known to you all things which are happening here” (Colossians 4:7-9). Fellowship in The Gospel ~ “I thank my God upon every remembrance of you, always in every prayer of mine making request for you all with joy, for your fellowship in the gospel from the first day until now, being confident of this very thing, that He who has begun a good work in you will complete it until the day of Jesus Christ; just as it is right for me to think this of you all, because I have you in my heart, inasmuch as both in my chains and in the defense and confirmation of the gospel, you all are partakers with me of grace. For God is my witness, how greatly I long for you all with the affection of Jesus Christ” (Philippians 1:3-8). “And with many other words he testified and exhorted them, saying, ‘Be saved from this perverse generation.’ Then those who gladly received his word were baptized; and that day about three thousand souls were added to them” (Acts 2:40-41). Fellowship in Suffering ~ “But what things were gain to me, these I have counted loss for Christ. Yet indeed I also count all things loss for the excellence of the knowledge of Christ Jesus my Lord, for whom I have suffered the loss of all things, and count them as rubbish, that I may gain Christ and be found in Him, not having my own righteousness, which is from the law, but that which is through faith in Christ, the righteousness which is from God by faith; that I may know Him and the power of His resurrection, and the fellowship of His sufferings, being conformed to His death, if, by any means, I may attain to the resurrection from the dead” (Philippians 3:7-11). #1 Keep In Touch With God (spend time in the Word of God and in Prayer) ~ “Pray in the Spirit on all occasions with all kinds of prayers and requests. With this in mind, be alert and always keep on praying for all the Lord’s people” (Ephesians 6:18, niv). Successful soldiers know that they must keep in constant communication with their leaders. If the message from the Commander in Chief is distorted or lost, the battle will end in defeat. Our Supreme Leader has given clear orders in His written Word and He gives us specific directions while in the trenches of warfare through His Spirit. Our enemy hates it when we apply the Word of God and pray. Keep in touch with all three members of the Trinity. Fellowship with the Father ~ “That which we have seen and heard we declare to you, that you also may have fellowship with us; and truly our fellowship is with the Father…” (1 John 1:3). Fellowship of the Son ~ “God is faithful, by whom you were called into the fellowship of His Son, Jesus Christ our Lord” (1 Corinthians 1:9). “That which we have seen and heard we declare to you, that you also may have fellowship with us; and truly our fellowship is with the Father and with His Son Jesus Christ” (1 John 1:3). Fellowship of the Spirit ~ “Therefore if there is any consolation in Christ, if any comfort of love, if any fellowship of the Spirit, if any affection and mercy” (Philippians 2:1). “May the grace of the Lord Jesus Christ, and the love of God, and the fellowship of the Holy Spirit be with you all” (2 Corinthians 13:14). #2 Keep In Touch With Your Fellow Soldiers (have R&R with fellow warriors) ~ “Let us consider one another in order to stir up love and good works, not forsaking the assembling of ourselves together, as is the manner of some, but exhorting one another, and so much the more as you see the Day approaching” (Hebrews 10:24-25). The early disciples and the early church exhibited true unity. United in Prayer ~ “These all continued with one accord in prayer and supplication, with the women and Mary the mother of Jesus, and with His brothers” (Acts 1:14). “So when they heard that, they raised their voice to God with one accord and said: ‘Lord, You are God, who made heaven and earth and the sea, and all that is in them’” (Acts 4:24). United in the Word of God ~ “Therefore those who were scattered went everywhere preaching the word. Then Philip went down to the city of Samaria and preached Christ to them. And the multitudes with one accord heeded the things spoken by Philip, hearing and seeing the miracles which he did” (Acts 8:4-6). United in Gathering Together for Fellowship ~ “So continuing daily with one accord in the temple, and breaking bread from house to house, they ate their food with gladness and simplicity of heart” (Acts 2:46). United in Witness and Action ~ “So continuing daily with one accord in the temple, and breaking bread from house to house, they ate their food with gladness and simplicity of heart, praising God and having favor with all the people. And the Lord added to the church daily those who were being saved” (Acts 2:46-47). “And through the hands of the apostles many signs and wonders were done among the people. And they were all with one accord in Solomon's Porch” (Acts 5:12). United in Peace and Existing in True Unity ~ “It seemed good to us, being assembled with one accord, to send chosen men to you with our beloved Barnabas and Paul, men who have risked their lives for the name of our Lord Jesus Christ. We have therefore sent Judas and Silas, who will also report the same things by word of mouth” (Acts 15:25-27). Adam & Eve (the first temptation) ~ “Now the serpent was more cunning than any beast of the field which the Lord God had made. And he said to the woman, ‘Has God indeed said, “You shall not eat of every tree of the garden”?’ … So when the woman saw that the tree was good for food, that it was pleasant to the eyes, and a tree desirable to make one wise, she took of its fruit and ate. She also gave to her husband with her, and he ate. … And the Lord God said to the woman, ‘What is this you have done?’ The woman said, ‘The serpent deceived me, and I ate.’ … To the woman God said: ‘I will greatly multiply your sorrow and your conception; in pain you shall bring forth children; your desire shall be for your husband, and he shall rule over you.’ Then to Adam He said, ‘Because you have heeded the voice of your wife, and have eaten from the tree of which I commanded you, saying, “You shall not eat of it”: cursed is the ground for your sake; in toil you shall eat of it all the days of your life. Both thorns and thistles it shall bring forth for you, and you shall eat the herb of the field. In the sweat of your face you shall eat bread till you return to the ground, for out of it you were taken; for dust you are, and to dust you shall return.’ And Adam called his wife's name Eve, because she was the mother of all living” (Genesis 3:1, 6, 13, 16-20). Samson & Delilah ~ “Afterward it happened that Samson loved a woman in the Valley of Sorek, whose name was Delilah. And the lords of the Philistines came up to her and said to her, ‘Entice him, and find out where his great strength lies, and by what means we may overpower him, that we may bind him to afflict him; and every one of us will give you eleven hundred pieces of silver.’ So Delilah said to Samson, ‘Please tell me where your great strength lies, and with what you may be bound to afflict you.’ … Then Delilah said to Samson, ‘Look, you have mocked me and told me lies. Now, please tell me what you may be bound with.’ So he said to her, ‘If they bind me securely with new ropes that have never been used, then I shall become weak, and be like any other man.’ … Delilah said to Samson, ‘Until now you have mocked me and told me lies. Tell me what you may be bound with.’ And he said to her, ‘If you weave the seven locks of my head into the web of the loom’ — So she wove it tightly with the batten of the loom, and said to him, ‘The Philistines are upon you, Samson!’ But he awoke from his sleep, and pulled out the batten and the web from the loom. Then she said to him, ‘How can you say, “I love you,” when your heart is not with me? You have mocked me these three times, and have not told me where your great strength lies.’ And it came to pass, when she pestered him daily with her words and pressed him, so that his soul was vexed to death, that he told her all his heart, and said to her, ‘No razor has ever come upon my head, for I have been a Nazirite to God from my mother's womb. If I am shaven, then my strength will leave me, and I shall become weak, and be like any other man.’ When Delilah saw that he had told her all his heart, she sent and called for the lords of the Philistines, saying, ‘Come up once more, for he has told me all his heart.’ So the lords of the Philistines came up to her and brought the money in their hand. Then she lulled him to sleep on her knees, and called for a man and had him shave off the seven locks of his head. Then she began to torment him, and his strength left him. And she said, ‘The Philistines are upon you, Samson!’ So he awoke from his sleep, and said, ‘I will go out as before, at other times, and shake myself free!’ But he did not know that the Lord had departed from him” (Judges 16: 4-6, 10-11, 13-20). Peter, the Apostle ~ “Having arrested Jesus Christ, they led Him and brought Him into the high priest’s house. But Peter followed at a distance. Now when they had kindled a fire in the midst of the courtyard and sat down together, Peter sat among them. And a certain servant girl, seeing him as he sat by the fire, looked intently at him and said, ‘This man was also with Him.’ But he denied Him, saying, ‘Woman, I do not know Him.’ And after a little while another saw him and said, ‘You also are of them.’ But Peter said, ‘Man, I am not!’ Then after about an hour had passed, another confidently affirmed, saying, ‘Surely this fellow also was with Him, for he is a Galilean.’ But Peter said, ‘Man, I do not know what you are saying!’ Immediately, while he was still speaking, the rooster crowed. And the Lord turned and looked at Peter. Then Peter remembered the word of the Lord, how He had said to him, ‘Before the rooster crows, you will deny Me three times.’ So Peter went out and wept bitterly” (Luke 22:54-62). Ananias & Saphira ~ “But a certain man named Ananias, with Sapphira his wife, sold a possession. And he kept back part of the proceeds, his wife also being aware of it, and brought a certain part and laid it at the apostles’ feet. But Peter said, ‘Ananias, why has Satan filled your heart to lie to the Holy Spirit and keep back part of the price of the land for yourself? While it remained, was it not your own? And after it was sold, was it not in your own control? Why have you conceived this thing in your heart? You have not lied to men but to God.’ Then Ananias, hearing these words, fell down and breathed his last. So great fear came upon all those who heard these things. And the young men arose and wrapped him up, carried him out, and buried him. Now it was about three hours later when his wife came in, not knowing what had happened. And Peter answered her, ‘Tell me whether you sold the land for so much?’ She said, ‘Yes, for so much.’ Then Peter said to her, ‘How is it that you have agreed together to test the Spirit of the Lord? Look, the feet of those who have buried your husband are at the door, and they will carry you out.’ Then immediately she fell down at his feet and breathed her last. And the young men came in and found her dead, and carrying her out, buried her by her husband. So great fear came upon all the church and upon all who heard these things” (Acts 5:1-11). The Divine Temptation (Jesus is tempted of Satan) ~ “Then Jesus was led up by the Spirit into the wilderness to be tempted by the devil. And when He had fasted forty days and forty nights, afterward He was hungry. Now when the tempter came to Him, he said, ‘If You are the Son of God, command that these stones become bread.’ But He answered and said, ‘It is written, “Man shall not live by bread alone, but by every word that proceeds from the mouth of God”.’ Then the devil took Him up into the holy city, set Him on the pinnacle of the temple, and said to Him, ‘If You are the Son of God, throw Yourself down. For it is written: “He shall give His angels charge over you,” and, “In their hands they shall bear you up, lest you dash your foot against a stone”.’ Jesus said to him, ‘It is written again, “You shall not tempt the Lord your God”.’ Again, the devil took Him up on an exceedingly high mountain, and showed Him all the kingdoms of the world and their glory. And he said to Him, ‘All these things I will give You if You will fall down and worship me.’ Then Jesus said to him, ‘Away with you, Satan! For it is written, “You shall worship the Lord your God, and Him only you shall serve”.’ Then the devil left Him, and behold, angels came and ministered to Him” (Matthew 4:1-11). The intent of this blog is to present concise information about Christian living, foundational Christian truth, and how to share the Christian faith. The goal of this blog is to exalt Jesus Christ. Welcome to the "Abundant Life Now" blog hosted by author Robert Lloyd Russell. Occasionally Extra or Special postings will take precedence over the normal schedule. The 10 most popular posts are listed at the bottom of this page. Additionally, you will find a few of Robert Lloyd Russell’s Favorite Posts at the bottom of the data in the right hand margin (in no particular order). Books that engage, exhort, enlighten, entertain, encourage, educate, and edify. For more information and specific details see www.BOOKSrlr.com. GOD LIGHT: Sunlight Sonlight -- Thirty years in development, this just-released revolutionary book provides a new look at God’s attributes! Part Two provides an overview of the “Light of the World” in Scripture (from Creation to the New Creation). Part Three compares the interaction of physical objects with natural light and human beings with spiritual light. All three parts are full of practical ramifications and applications. Chapters are short—great for busy lifestyles. Each chapter has a Think & Grow section for further contemplation. This is a great book for group study! 2012 Beverly Hills Book Award. 2012 USA Best Book Awards. 2013 The Word Guild (Canada). Order now through Amazon or find more information at the GL tab above or the author's website. ONE PRECIOUS PEARL: God's Design for His Church -- This landmark book is a fascinating study of Jesus' parable of the "one pearl of great price." Reader Views Reviewers Choice Award (USA). The USA "Best Books 2011" Award. Order now through Amazon or find more information at the OPP tab above or the author's website. Confidently know what God wants you to do and consistently make right decisions. Order now through Amazon or find more information at the TWBDOE tab above or the author's website. 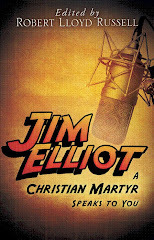 JIM ELLIOT: A Christian Martyr Speaks to You – For the first time his own words have been transcribed on four critical topics. This book will inspire and change lives. Order now through Amazon or find more information at the JE tab above or the author's website. 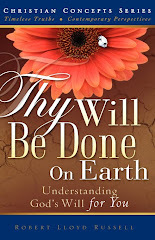 The Old Schoolhouse Magazine Book Review of THY WILL BE DONE ON EARTH. Where is ALN being read? Are You an April Fool? …an Everyday Fool?